"Project Nomads is a futuristic wonderland of amazing graphics and compelling gameplay!" 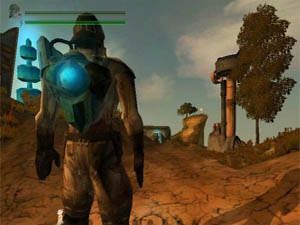 Project Nomads is the latest game by German developers Radon Labs that takes place in a ruined futuristic world that contains highly intelligent robots, space travel and strange sentient alien creatures. Project Nomads allows players to choose between one of three friends who live on a strange planet that has been totally devastated. Unlike normal planets that orbit around the sun, this planet is disjointed and is now a collection of floating rocks (islands) that are somehow held together by the planets gravity. Unfortunately for you and your friends, one of your joy flights around the planet has gone horribly wrong. A strange army of unknown creatures has attacked your home world of Aeres and you and your three friends have been separated. Just when you thought things couldn't get any worse, a strange ghostly blue alien appears that gives a choice, trust me and I will help you save your friends and the planet, ignore me and all will be lost. The basic premise of Project Nomads is a futuristic adventure game that has a touch of role-playing, flight simulator and real-time strategy game thrown in for good measure. By listening to the alien at the start of game, you will learn the secrets of controlling these huge floating islands that will allow you to slowly access the 25 missions that this game contains. Your characters can also perform a variety of different moves, battle various enemies and solve complex puzzles to help free your planet from this invasion. On later levels, you must man turrets and build bases in order to control and defend these huge floating pieces of rock. The control system of the game uses a combination of mouse and keyboard movements to move your characters in the world of Project Nomads. The mouse is generally used to rotate the camera angles while the keyboard is primarily used to perform your characters movements. Depending on which character you select, they all have different attributes that will have an effect on the game. Project Nomads is also a real-time strategy game that sees you building bases on different rocks in order to progress through the game. By creating bases on these floating behemoths, you are able to defend, engage, explore and progress through the game. One of the most coolest features of the game is the ability to explore different islands by using your jetpack or planes that you acquire in the game. However, be forewarned, this is extremely dangerous to do if you do not have your base well defended. When you first run Project Nomads, the first thing that you will notice is the awesome game engine that contains some amazing graphics. The developers have done a great job at recreating this strange alien world from the alien skies to the texture details on the surface. 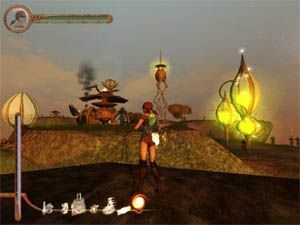 The game also contains a variety of special effects such as particle effects and some of the most amazing lighting that I have seen in a game. The first level of the game has this unearthly red/orange hue to it that helps portray a sense of impending doom. As you progress through the game, the colours will change and so will the lighting. Graphically, the game reminds me of a basic version of Giants but it has enough features to stand on its own. That said, Project Nomads is also a very intensive program that will require a powerful computer with the latest 3D card in order to play this game with full detail, without any slowdown. 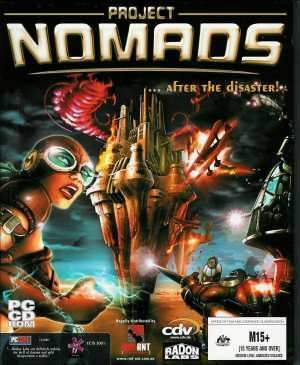 The character acting of Project Nomads is unfortunately a little stale and I'm sure something has gone missing from the original German version of the game. It's not to say that the voices are bad, it's just that a little more oomph was required. Musically, Project Nomads contains a decent soundtrack that helps get you into the atmosphere of the game that changes as the game progresses. 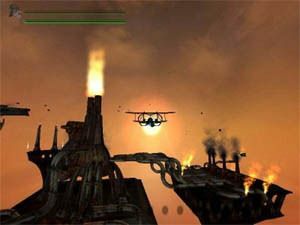 The sound effects also contain all the sound effects you would expect to hear in battle and exploration such as weapons, jet packs and explosions. In conclusion Project Nomads is a strange game that does take some time getting use to because it's not really an adventure game, flight-simulator, real-time strategy or role-playing game but a combination of all four. The storyline of the game is engaging and will hopefully draw the gamer into this strange universe that contains some amazing graphics and special effects. If you loved Giants, you would probably get a buzz from Project Nomads and gamers who want a product that is not based in one genre should also check this game out.